I never really thought much about community until recent years. I think I just took it for granted, or didn’t see it as that important. As I finished graduate school and decided to stay in Montreal despite my family being in another province, and many of my friends moved away, I started to think more about what it means to be part of a community. More recently, in my professional life as a psychologist, I’ve noticed that often clients express to me that they feel lonely, they wish they knew more like-minded people, and their lives lack purpose and meaning. All these factors, plus knowing that the need to belong is a powerful human motivator (1), lead me to be more interested in how community affects mental health and well-being. It didn’t take much looking into the research to find out, not surprisingly, that a lack of social connection is bad for you. In fact, loneliness kills. If you’re lonely, you’re more likely to be depressed and anxious (2, 7), and you have an increased risk of heart disease, stroke, cancer, and early death (6, 5, 3). For more on this topic, check out: The Friend Effect: Why The Secret of Health and Happiness is Surprisingly Simple. Do we really need community though if we have some solid friendships? Being part of a community has the added benefit of allowing us to feel like we belong to and are accepted by a group, similar to how we ideally feel in our families, a sort of emotional or spiritual “home”. Additionally, often communities are centred on a goal (e.g. training for a marathon) or a cause (e.g., protecting the environment), which can give us a sense of purpose and meaning. Creating meaning in our lives is a key ingredient for a fulfilling life. We know that an important way to create meaning is to transcend ourselves by giving to and helping others or being part of something bigger than ourselves. Check out this article, There’s More to Life Than Being Happy, for why meaning is awesome. Knowing that community and social connection are good, if not great, for our physical and mental health, what gets in the way of us prioritizing these things? I know what stops me - I feel like I don’t have time; I should be working, exercising, doing errands, etc; I really like being home with my partner and my cats; I’d rather just spend time with the people I already know; meeting new people takes effort and can be awkward; group activities and community organizations could mean having to deal with annoying group politics and dynamics, and who wants to deal with that?! Thinking of the possible obstacles that get in the way of community building and nurturing social connection, I’ve made some (hopefully) simple and realistic suggestions below. 1) Prioritize it. You probably ARE too busy to focus much on community building and nurturing social networks. In order to make time for community, it might mean doing less of something else, like working. I used to cringe at the idea of working less to attend a community BBQ, or a municipal council meeting, because being productive at work is important and feels so good! However, just like taking time to exercise ends up enriching your life, taking time for community will do the same, but you need to give it a chance to experience the positive consequences. You might even find that having more balance in your life, and surrounding yourself with new, different people, could breath new life into your work and get those creative juices flowing! 2) Build community at work. Work can be an ideal, convenient place to nurture community because, depending on the type of work you do, you may be spending a lot of time at work and you and your coworkers are often together in the same location. At the psychology clinic where I work, called Connecte, it is one of our goals to make Connecte not just a clinic but a community. Some things we’ve done to make it more of a community are to hire like-minded people who value supporting one another, as well as hold regular meetings and communicate frequently with each other. We even had a morning yoga group going for a while. Not only do we feel supported, but we inspire and motivate each other too. 3) Get to know your neighbours. I grew up in a small, rural community where most people knew each other and no one ever locked their doors. Unfortunately, this is not the reality in most towns or cities! Getting to know your neighbours is the first step to building community close to home. To get to know your neighbours, you might try organizing a neighbourhood potluck, gathering for warm drinks in the winter, offering your neighbours leftover food/baked goods, or simply smiling and saying hi when you pass them on the street or in the entranceway. For some great suggestions on building community in your neighbourhood, check out: 10 Ways to Create Community Where You Live. 4) Get to know not just your neighbours! Check out this ingenious idea for group storytelling dinners, Bring Your Own Story, which aims to bring anyone willing together to have meaningful conversations and share personal stories, in a safe, non-judgmental space. 5) Do group activities that will allow you to “kill two birds with one stone.” For example, if you have young kids, you might join a group that is both fun and enriching for your kids, and where you can meet other parents. Check out Flow Music Therapy’s Music for Mothers and Babies group or the Montreal Families website for a comprehensive list of groups and activities. You will likely not only meet like-minded people, and decrease feelings of isolation and loneliness, but you will feel good knowing you’re creating positive experiences for your kids and loved ones. You might try other types of groups that are in line with your values and interests, like a book club, or a walking or running group. 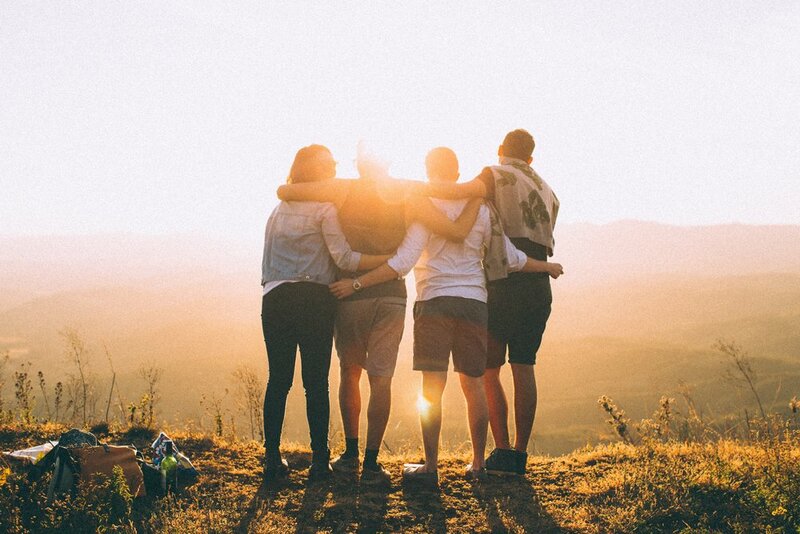 For more ideas on how to create social connections as adults, check out my colleague Miriam’s blog post, How To Make Friends When You Don't Have Play Dates: The Importance Of Friendships In Adulthood. An especially good activity to do with others is to eat dinner together. We know that eating together as a family is associated with a slew of positive benefits, like eating more nutritious meals and even fewer symptoms of depression (4)! (Learn more about this research here: Project EAT Publications.) To increase your chances of having dinner with friends and fitting it into your busy schedule, don’t be a perfectionist about it! Cook something simple, make it a potluck, or even order in. 6) Do a group activity that is centred on something that you find meaningful. As I mentioned above, we get meaning from helping others or being part of something larger than ourselves. I get a lot of meaning from protecting the environment and connecting with nature, and recently I was fortunate enough to get involved with a local gardening community, so now I’m learning all about gardening while being part of a wonderful community of like-minded people. Maybe there’s something similar in your neighbourhood that you could be a part of? As I mentioned above, sometimes we might hesitate to join or stick with a group activity or organization because we don’t want to deal with the interpersonal issues that will inevitably arise (e.g., differing perspectives/values, clashing personalities, etc.). I think I could probably write a whole other blog post on this topic, but here are some things that come to mind that I hope will be helpful in navigating group dynamics. 7) Know your boundaries. In any social situation, recognizing and asserting your limits, essentially making sure you’re taking care of yourself and your needs, will help you have more energy and compassion for others. If you notice yourself feeling resentful towards the group or others in the group, this may be an indication that you’re not respecting your own boundaries. Check out my colleague Danit’s blog post on setting boundaries. 8) Take others’ perspectives and embrace a compassionate mindset. Most of us have some challenges, hurt, or pain that we will sometimes act on, and act on in a way that is not the most constructive or pleasant for those around us. If we can take time to consider where others are coming from, what their situation is, or at least give them the benefit of the doubt and assume that they are trying their best with the tools they have, we will likely have more compassion for them. To help myself get into a compassionate mindset when considering others, I love this story introduced to me by Tara Brach, about how essentially when others are acting in ways that we perceive as unpleasant, annoying, etc., they likely have their leg caught in a trap! 9) Accept that we will all annoy each other. When spending a lot of time with any individual, we will likely get annoyed with them at some point. This is normal! And guess what? We will annoy others too. Yup, we will all annoy each other, and accepting this, while asserting our boundaries and having compassion, will likely make our group experiences more tolerable, positive, and conducive to personal growth. 10) Practice good listening! Good listening is the key to authentic, intimate connections. Nowadays, when it’s easy to pick up our phones and check the weather while our friend tells us a story, we might not be the best at listening. For more on this, check out my favourite video on good listening: Are You A Good Listener? I hope these tips help you squeeze a bit more community into your lives so that your mind and body might reap the rewards. Happy community building! Cacioppo, J. T., Hawkley, L. C., & Thisted, R. A. (2010). Perceived social isolation makes me sad: Five-year cross-lagged analyses of loneliness and depressive symptomatology in the Chicago Health, Aging, and Social Relations Study. Psychology and Aging, 25, 453– 463. Holt-Lunstad, J., Smith, T. B., Baker, M., Harris, T., & Stephenson, D. (2015). Loneliness and social isolation as risk factors for mortality a meta-analytic review. Perspectives on Psychological Science,10(2), 227-237. Pinquart, M., & Duberstein, P. R. (2010). Associations of social networks with cancer mortality: a meta-analysis. Critical reviews in oncology/hematology, 75(2), 122-137. Zawadzki, M.J., Graham, J.E., & Gerin, W. (2013). Rumination and anxiety mediate the effect of loneliness on depressed mood and sleep quality in college students. Health Psychology, 32(2), 212–222.